Are you looking for emergency septic repair services in the South Hill, WA area? Call VAC-TEC LLC now to book a service appointment with our friendly, knowledgeable team. Problems with a septic system need professional attention. Ignoring these problems only makes the issue worse. If emergency septic repair is neglected, the tank may overflow or the drainfield may become filled with solid waste, which can cause a complete system failure. Think you may need an emergency septic pumping & cleaning service in South Hill? When a septic system starts acting out, it almost never happens during regular business hours. Your system may require an emergency septic pumping & cleaning during middle of the night or on a weekend. We can resolve your unexpected septic system problems with our emergency septic pumping & cleaning services, available for South Hill residents. With us, you can expect punctuality and professionalism, every time. Our state of the art pumping equipment and trained professional team mean we can take care of your emergency septic pumping & cleaning needs, quickly and efficiently. When it comes to septic care and maintenance, prevention is always better than cure. Our team can meet all of your septic systems needs, from septic system location to septic maintenance and emergency septic pumping & cleaning. A tiny commitment to your septic system maintenance will protect you from the need to seek an emergency septic pumping & cleaning service in South Hill. Even a good system which does not have regular care and maintenance may cause the need for an emergency septic pumping & cleaning. 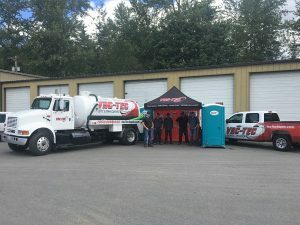 For more information on our emergency septic repair services in South Hill, feel free to call VAC-TEC LLC at (253) 777-4887. We are available 24/7.